Once again the Friendship Group had two fund raising Coffee Mornings for 2016. 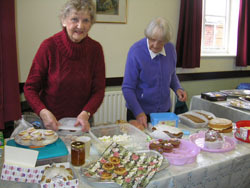 Held in the Recreation Room, one in April and the other in August, both were in aid of All Saint’s Church Fabric Fund. 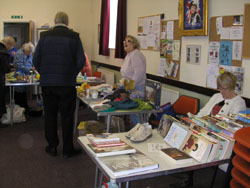 There were all the usual stalls of books, bric-a-brac, tombola, some lovely hand crafts and of course delicious homemade cakes, bakes and preserves. 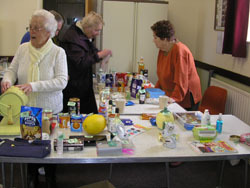 On each occasion a raffle was held of many donated prizes including a large food hamper supplied by Mrs Kath Whitcombe, Wine, Biscuits, toiletries, chutney and foot treatment. Refreshments of tea, coffee and biscuits were available for the steady stream of visitors to both events who received a warm welcome. The first event raised £331.55 and the second raised £241.40. In October an Auction was held for the remaining items from both events which raised £41.35. The final amount was £1,230.00, with a cheque presented to the Church in October. The Friendship Group do a wonderful job with their fund raising and their calendar is always full of events for the year including speakers and trips. Anyone interested in joining them would be most welcome.